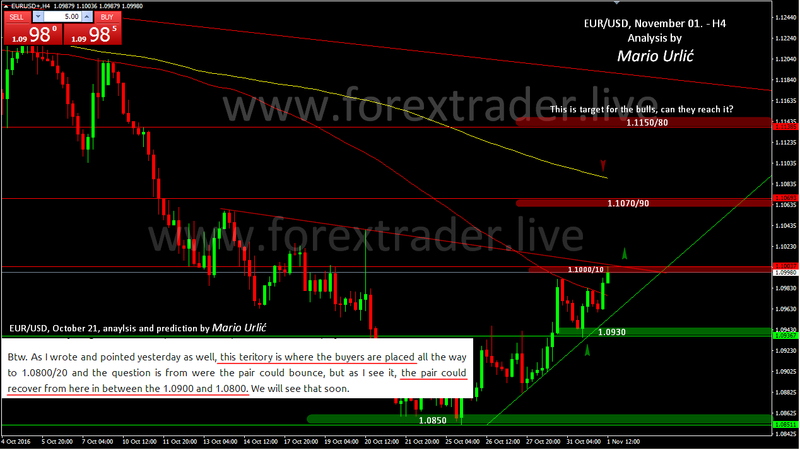 Should I mention that everything exactly happened in this pair as I wrote in my previous EUR/USD analysis from October 21. Well, it did and I know that some of you (Mark) will be pissed off but… 😉 The pair bounced from 1.0850 and the buyers have reached 1.1000 today, the minor resistance, but it should be broken if they want to push the pair higher toward the next resistance at 1.1100 and H4/MA200, where the sellers could wait. But, the buyers have the target much higher as they would like to reach 1.1150/80, the daily MA100 and 200. Can they? It will be interesting to see. On the way down, support starts at 1.0975 > 1.0930 is the strong one. Samo jedno te molim a to je da odradiš ovu tvoju FXtreme x 100 misiju do kraja, ništa više. Pojest će se mnogi od zavisti i zlobe jer jedva čekaju da ne uspiješ. YES YOU CAN!!!! Pozdrav maistore,prvo dobro sto si dosao natrag a drugo analiza mog naj.istrumenta pa nije moglo bolje za povratak! Nastavak slijedi,ovo si predvidija odlicno nisam mislio da bi mogao doci 1.1150 ali sad vec neznam ako podbace u petak podaci mogla bi bit i visa a i ova FBI istraga je zakomplicirala situaciju a i inace USD slabi pred izbore.L.P. I was really very surprised and happy to receive mail from website…..thanks for deciding to continue with your posts and charts……. Fantastic prediction my friend, as always. I am glad that you have decided to continue with youre analysis and comments. I am very grateful for everything you do for us, thank you very much.